There’s no place like home. That age-old adage is never truer than when discussing care for older or disabled adults, medically fragile children or anyone recovering from an accident or illness. 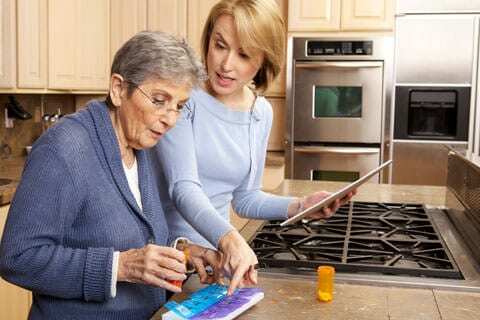 Recent surveys have shown that most older adults want to stay in their homes, regardless of their health condition, and over the last decade, technological advances have allowed for increasingly advanced medical care to be provided in non-hospital settings. “Hospitals are discharging quicker … and patients need support when they come home,” said Bonnier Boyer, president of Comfort Care of Holy Spirit, which provides in-home medical care. Not only are people becoming more vocal about their desire to stay at home, but it’s considerably less expensive For the cost of every one person in a nursing home, nearly three could be cared for in their own home or community. “People are still unaware that for a year in a nursing home you’re looking at up to $80,000,” said Vicki Hoak, executive director of the Pennsylvania Homecare Association. “It’s much cheaper to care for someone in home because most of the time they don’t need that round-the-clock care that’s in a nursing home.” An average homecare visit costs $150, while the average hospital visit costs $1,500 a day, association figures show. One year of care provided in a person’s home would cost almost $13,000 while the state, through Medicaid, would have to pay $35,000 for the same care in a nursing home. There is no financial eligibility requirement for OPTIONS-based services. However, consumers may be required to make a co-payment for services based on income. “OPTIONS is a lottery-funded program that allows you to earn a little more but still requires assessments to be sure you need the services,” Hoak said. “It provides a significant amount of help for people who may have significant needs but don’t financially qualify for Medicaid.” Another possibility is the state’s 60+ Waiver or PDA Waiver, a Medicaid program that requires participants to meet income guidelines and certain medical diagnoses to receive medical services in the home. Other options for paying for homecare services could be a long-term care insurance policy or a reverse mortgage. Long-term care insurance policies are privately paid policies tailored to an individual’s needs that could help cover homecare or nursing home care. Reverse mortgages tap into the value of a senior citizen’s home to provide money for medical expenses or other needs. Also available to help seniors understand their choices is APPRISE, the state’s free health insurance counseling program to help Pennsylvanians over 60. Counselors are specially trained volunteers who can answer Medicare questions and provide objective information about Medicare, Medicare supplemental insurance, Medicaid, long-term care insurance and prescription benefits. “It’s like stitching together a quilt,” Hall said. “Family feels it’s part of their responsibility to take care of their own and treat their parents and elders the way they want to be treated. The truth is the family can’t do it on their own.” The medical needs may be too complex or family lives too far away, he said. Nearby relatives may not be able to leave their jobs or families to provide proper support. “We try to make it possible for a family to figure out how to successfully honor the preference to stay in the home and have families be part of the solution,” Hall said.